No, we are replacing them with two ball bearings plus a spacer, this is detailed in the linked post. 2x5x2.5mm ball bearings are pretty common size and should be easy to find. Yup, the older 9XX series models used bigger fans and seemed to be much more durable (pretty sure those were double ball bearings, only have about three failures). 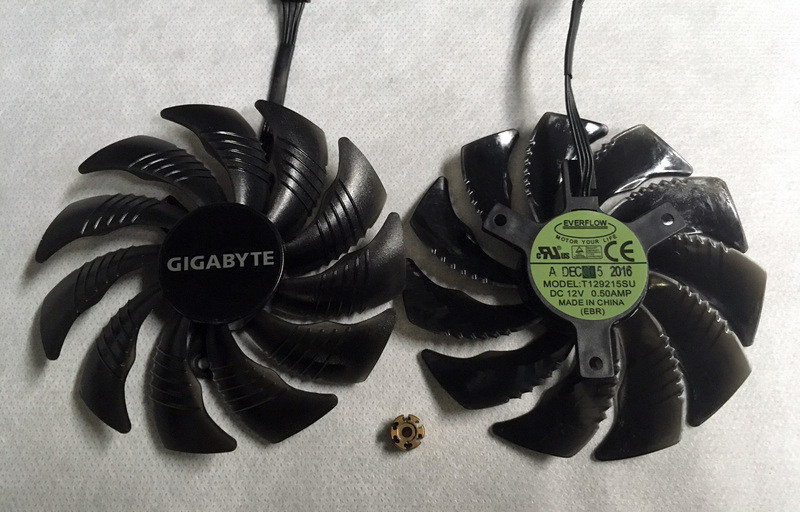 The new Pascal cards all use smaller fans that seem to fail just as fast as Gigabyte fans. Very much, sadly. Giving a second tier company a pass is one thing, but Asus should know better. Penny pinching on premium products is dumb. How do you remove the bushing in the image?, l have tried but l lost my mind trying without breaking the plastic. Ive mesured my bushings and they seem to be 2.5x8x5. All the bearings i found seem pretty expensif, 10$ a piece. would be 40$ per gpu / 240$ of bearings per riggs. A single bearing per fan wouldnt do the job ? 2.5x8x5 ?